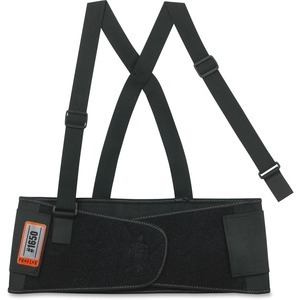 Fits waists that measure from 46" to 52"
A hybrid of safety, support and comfort, this ProFlex Back Support helps you win your workday tug of war and reduce the risk of back injuries. It bends over backward to merge true innovation with real performance to prove there's a better way when it comes to lifting something heavy. The all-elastic, 7-1/2"" body offers extra-firm support. Adjustable, detachable suspenders help make sure it fits. Close easily with the single-strap closure. Design also features nonconductive polypropylene stays, stretchable bias binding with zigzag stitching, and rubber track webbing. The back support is great in material handling, construction, warehouse/distribution, maintenance, freight/baggage, assembly/fabrication and landscaping/grounds. The 3X large size fits waists that measure from 46"" to 52"". Waist Size 46" - 52"